In essence, the fox uses his cunning to pounce, sneak upon, play, etc. to attack the hedgehog. However, the hedgehog needs only do one thing and do it well – defend itself. Against the cunning fox, the hedgehog simply rolls into a ball with its spines pointed outward in all directions. Jim Collins, author of From Good to Great, took the parable and related it to organizations. He suggests companies should find the one thing they’re good at to beat competitors. 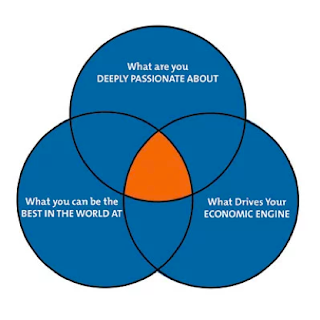 There are three factors to consider what a company is good — illustrated below. The VP of Sales I spoke with goes on to share how his sales organization must also be the fox. I couldn’t agree more in today’s age where companies are rising from every corner of the internet. 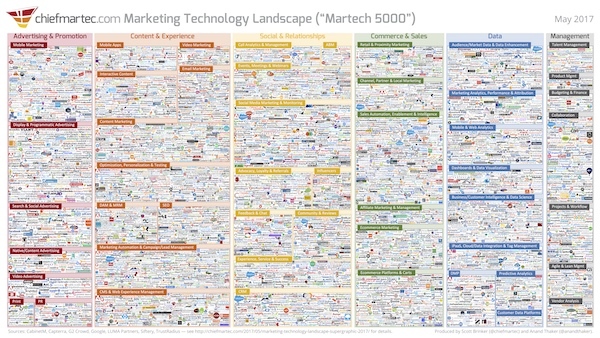 In fact, Chief Martec posted last year its annual Marketing Technology Landscape. They mapped almost 4,900 companies. This is a significantgrowth from the 2012 landscape of roughly 150 companies. The environment for startups is both exciting as well as daunting. Great startups must do one thing well to survive. Really, they must do one thing well to earn customers. But as they compete against the budgets of their much larger counterparts, startups must also be cunning and use their agility to outmaneuver larger companies. To that point, people must also think about their own abilities as a hedgehog and as a fox. How are folks surviving and growing beyond themselves and their counterparts? Consider your now… like a hedgehog, what is the one thing you are truly great at? How are you (or can you be) cunning like a fox?